Available to buy or to hire. 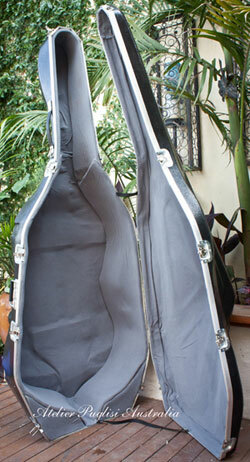 Made locally by Tony Villanti, these fibreglass hard cases offer the best protection available for your double bass. Their hard fibreglass exterior is tough and durable and are perfect for the frequent traveller. The fibreglass exterior is easily patched and repaired should it be damaged during travel or airline handling. Available in a wide variety of colours and finishes!! Includes matte, gloss, marbled effects and sparkles (some of which will come at an extra cost). Comes in 4/4 size only. Please refer to our Instrument/Case hire page for further information about hiring these cases, including pricing.